In 1979 and 1980, Jef Raskin's Macintosh project was a four person research effort with a tenuous existence. It wasn't considered to be very important within Apple, and was almost cancelled a couple of times. When Apple had another major reorganization in the fall of 1980, it was terminated again, but Jef pleaded with Mike Scott and Mike Markkula for more time, and was granted three more months to show that he was really onto something. As part of the re-org, the four person Macintosh team (Jef Raskin, Brian Howard, Burrell Smith, Bud Tribble, soon to be joined by Joanna Hoffman) relocated to a small office building a few blocks from the main Apple campus. The new office, located at 20863 Stevens Creek Boulevard, was called the "Good Earth" building, because it was adjacent to a Good Earth restaurant. In fact, the office used to be Apple's very first office in Cupertino, after they moved out of Steve Jobs' parents' house, and was later used as the first office of the Lisa project, when the Lisa team had fewer than ten employees. The Mac team moved in, outfitting it with lots of bean bag chairs and all kinds of interesting toys. Jef was very playful and always encouraged his team to express themselves creatively, so the office quickly began to look more like a day care center than an engineering lab, overflowing with playthings. Periodically, work would cease and the entire team, plus any visitors who might be on the premises, would play some organized game, usually led by Jef and Brian. 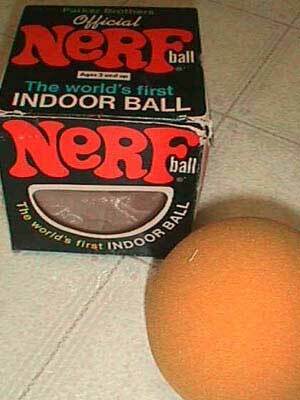 The favorite game, which was usually played at least once a day, just after lunch, was a form of tag played with Nerf balls. There were dozens of brightly colored Nerf balls scattered around the office. The rules would be improvised, but usually the person who was "it" had to confer it-hood on someone else by hitting them with a Nerf ball. This inspired everyone to surround their work area with barricades made out of cardboard, to provide cover during the game, making part of the office look like a cardboard maze. Jef and Brian were both serious musicians, so the office was also littered with a variety of musical instruments, sometimes erupting in spontaneous concerts. Another one of Jef's interests was model airplanes and automobiles, especially radio controlled ones. It wasn't unusual to see a radio controlled car dart underneath your desk, and occasionally everyone would go outside to see the maiden voyage of the latest plane. Jef was writing his "Book of Macintosh" during much of 1979 and all of 1980, articulating his vision in ever finer detail. Burrell's 6809-based prototype came alive in the early part of 1980, but then he went off to work on the low cost Apple II project. Jef hired Marc Lebrun to write software in early 1980, but Marc was more interested in Lisp machines than a limited memory microcomputer like the Mac, so nothing much happened until he was replaced by Bud Tribble in September 1980. Bud knew Jef from UCSD, and was also good friends with Bill Atkinson. They had a part time, two person consulting company together in Seattle called Synaptic Systems while they were both graduate students. Bill and Jef convinced Bud to take a one year leave of absence from the M.D/Ph.D. program he was pursuing at University of Washington at Seattle. Bud was in the fifth year of a seven M.D/Ph.D. program. Instead of returning to med school, Bud moved into a spare room at Bill Atkinson's house, and started work on the Mac project at Apple. He quickly began to breathe life into Burrell's languishing prototype, writing some graphics routines for the 6809. So even though the Mac project had been going for more than a year, the move to Good Earth in October 1980 came at an interesting time, with a new but limited lease on life, and software finally starting to happen. But the Good Earth era was rather short lived. Around two months after the move, Bud convinced Burrell to consider using the 68000 processor instead of the 6809. Burrell came up with a brilliant design, catching the attention of Steve Jobs. Steve took over the project and quickly recruited most of the early Apple II crew that he trusted, including Steve Wozniak and Rod Holt, and moved the project to larger offices a half mile away, in Texaco Towers (see Texaco Towers). Never knew that Jef was such a rascal? Every time I see him (on tv) and last on the ScreenSavers he seems so subduded or distant. Those must have been GREAT times during the early stages of the Mac Dev. Efrain: I still play music and fly model planes. See my articles in Fly RC, Model Airplane News, Radio Control Micro Flight and other magazines. We toss around balls, play bocce, and juggle in my present office, too. These continue to be great times. Everybody: The last paragraph of the story is somewhat misleading. I discouraged the 68000 only because it would have made the product too expensive. When the price came down, the only problem was that it could address only 64K bytes of memory. Burrell found a very clever way of allowing it to address 128K of memory, at which point I changed the project from the 6809 to the 68000. I still have my memo stating the rationale for the change. It was before Jobs took over. The legend has it that I opposed the 68000 for various irrational reasons, depending on whose account you read. As it happens, I wanted to use it early on, but could not meet the price point that I had promised management. HAHAHAHA! Hey Jef. I did not think that you would have replied back. I'm glad to see that you take the time to read the comments and add to them. I hope that you did not take offense to my comments, it was merely my observation from the few times that I have seen you. You sound alot like me in many ways. Hope to meet you one day and mayby fly some RC in Central Park or something (hehehehe). If you are ever in NYC. Well on to read some more. Absolutely amazing. This is the most surreal site on the internet. Great job! I really enjoyed this story as I worked at Catapult Entertainment in the mid 90s, which was based in the same 20863 building. We went to Good Earth quite a bit, as well as those from the other stories -- Vivis, Ciscero's, etc. Sadly, the Good Earth is no more. This story and Jef's comments really prove that reality is sometimes much less dramatic than some people's accounts of how things went down. Evidently, Andy remembered things a bit differently based on his point of view. It must have been rather annoying to have the project lead pulled suddenly and replaced by someone who didn't know what was going on (Steve Jobs). Anyways, too bad Good Earth is no longer there. Sounds like it was an interesting restaurant. I was hired early (#142) to help get the first few 100 Apple lls in and out of the service department in an organized way. On my first day, Mike Scott saw me waiting at the door to my work area and let me in. I asked what he did there, I had no clue who he was. Then I remember seeing 40 or so Apple IIs that need to be handled. After a while with the help of Burrell we created a small program to handle all these bad Apples. He was a service tech at the time, we had a good little department, 5 guys. The entire parts department was one 4'x6' black cabinet (I had he keys). I remember Burrell being very clever and nice to work with. I eventually left Apple, his parting comment "So let me get this straight, you are leaving Apple to sell forms?" He was right, it was a crazy move but a good path for me, I do miss the old Apple. I installed a 4200 pair telephone cable into one of the Apple buildings in 1979 or 1980. I was among the first women Construction Cable Splicers for PT&T at that time. I am guessing it was on Bandley. A typical large cable was 3600 pair. This 4200 pair required a larger case in manholes and the copper wires were thinner. As far as I know it was the first 4200 pair cable laid in Cupertino, Ca. It required extra training and I know phone company engineers were watching closely. It was built by 2 women. I terminated 8,400 wires on 66 blocks in the middle of the building that only had a roof on it- I drove my PT&T van into the building.